Taking performance and innovation to new levels. Bobcat is launching the exciting new R-Series mini-excavators from 2-4 tonne. 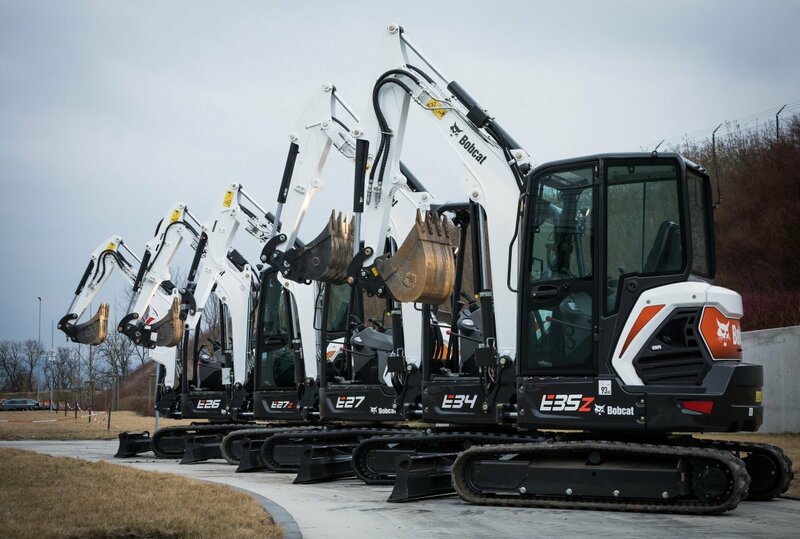 The new range of five compact excavator models – the E26, E27z, E27, E34 and E35z – offers a best-in-class mix of high digging forces, superb stability and smooth controllability of working functions complemented by low weights for easy transportation. Excellent machine fit and finish plus new ground-breaking design features will make the new Bobcat R-Series unique on the market. 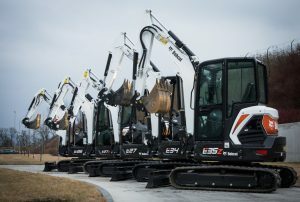 The new excavators introduce many state-of-the-art features and offer enhanced levels of quality and robustness. They utilize newly developed flexible machine platforms that allow different configurations of models and specifications to suit a wide range of applications and customer needs. In addition, while taking engineering and productivity to unheralded heights, the development team for the new machines has ensured they offer greatly enhanced operator comfort and functionality and the best fit for key applications. 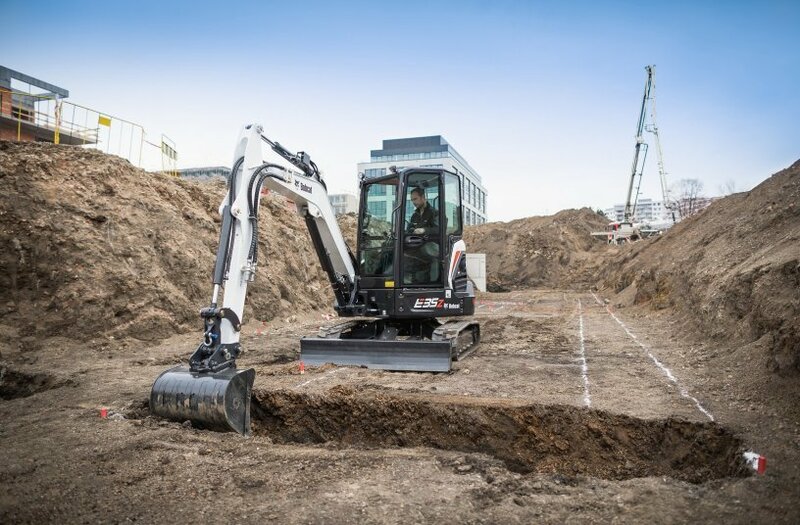 Supported by over 30 years of experience as one of the major players in the market, the new 2-4 tonne compact excavator range has been designed by the Bobcat European Innovation Center for customers in Europe. Designing products around the operator is part of Bobcat’s essential DNA. That is why there is a completely new cab being introduced throughout the whole of the R-Series range. The larger operator space and premium interior deliver best-in-class comfort with an improved entry/exit thanks to new ergonomic 3D handles and a wider door. The new cab also features significantly larger windows and narrower pillars giving market-leading all-around visibility. Inside the low noise-low vibration cab, the operator has the benefit of new joysticks and new optimized metal travel pedals. The new minimal effort joysticks offer further enhanced controllability and smoothness of working functions. The operator can now also select a new industry unique ‘Selectable Auxiliary Control’ (SAC) system for up to five independent auxiliary hydraulic circuits. The SAC enables the operator to select/switch the control pattern for the auxiliary lines, which allows them to work with the most advanced attachments in the most convenient way. Another unique feature* is the revolutionary cylinder-inside-boom (CIB) design concept which provides strong, innovative protection for the boom cylinder as part of a reinforced workgroup designed to minimize free play and improve durability. The excavators can also be equipped with a deluxe control panel display offering extra information for increased troubleshooting and additional functionality of the new optional selectable auxiliary control system (SAC). While keeping proven, easy to maintain mechanical injection engines, all models meet the upcoming European Stage V engine emission regulations. The new generation of the popular E26 is an easy-to-use, robust machine optimized for specific rental industry needs while introducing the next level of operator comfort and features required by demanding owner-operators. 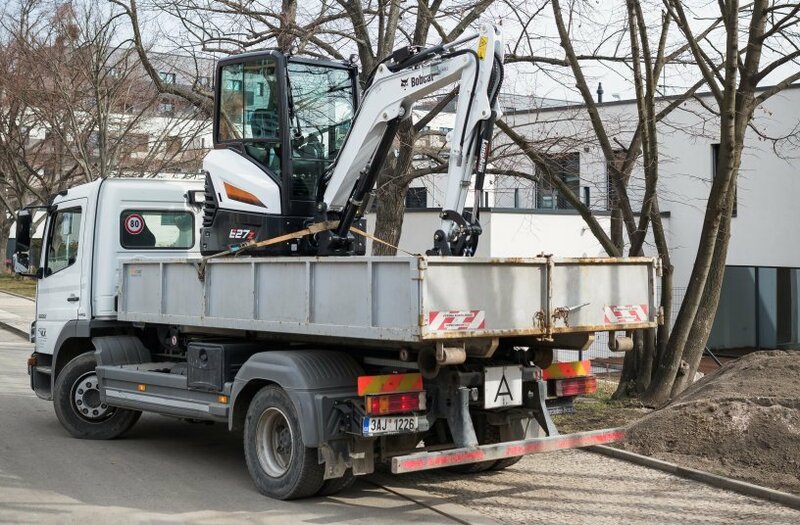 The new E26 excavator has a transport weight reduced by 100 kg but increased over-the-side lifting capacity. To overcome common issue in the rental market and thus protect the uptime, the E26 is now equipped with extra innovative features such as the cylinder-inside-boom (CIB) workgroup and its geometry, increasing protection against bucket collision with the cab. The new E27z model further enhances the excellent performance characteristics of Bobcat’s current E26 machine, with the largest cab for this size of machine on the market. As a true Zero House Swing (ZHS) machine (even with the optional heavy counterweight), the E27z offers the highest flexibility of movements when working close to walls, coupled with best-in-class 360 degree stability and a low weight for easy transportation. 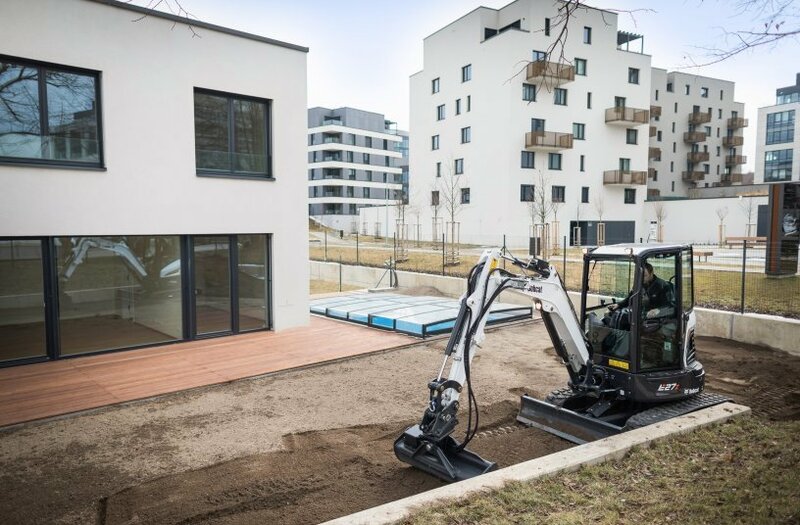 With the optional long arm and a premium cab, the E27z offers the digging output and operator comfort of much larger excavators, making it a machine of choice for urban operating construction companies. The new conventional swing E27 model introduces an in-class unique combination of superior stability, class leading digging performance and breakout forces, together with a transport weight that is still below the weight limits for appropriate trailers. Even with the optional heavy counterweight, the E27 offers just 280 mm of tail overhang which allows the machine to be operated in confined spaces. This makes the machine an ideal tool for highly demanding applications where performance together with transportability have a priority over compactness. Moving to the E34, this is a new generation 3.4 tonne conventional model offering higher stability coupled with excellent performance and further enhanced controllability. It features a new roomy premium cab with optional powerful air conditioning to ensure an ideal operator environment in all weather conditions. When transportability on a trailer and zero house swing are not needed, this machine offers a great mix of performance, stability and operator comfort. The E35z, a new generation model in the popular 3.5 tonne machine class offers the additional benefits of ZHS design. This excavator provides the best possible mix of compactness, a large operating range for the workgroup (especially with the optional long arm), great stability (two counterweight options available) and a large and comfortable operator area. This machine tops out the R-Series range and will be appreciated by customers with a need for a high specification ZHS model, whilst preferring the lower cost of ownership compared to higher tonnage machines. The E34 and E35z are also the only machines in their class which will be available with the optional automatic (hydraulic) track tensioning feature, which further minimizes the need for maintenance and the risk of de-tracking. A new blade design offers more robustness and enhanced self-cleaning ability. The redesigned boom cylinder guard is complemented by increased protection of hoses, pipes and valves on the workgroup. Bobcat is the only manufacturer offering two alternatives for positioning auxiliary couplers. Boom-mounted for optimal protection or arm-mounted for easy access. To easily and safely connect attachments, Bobcat offers multiple mechanical or hydraulic coupler systems. Lehnhoff type couplers will now be available with factory installed tilting adapters (controlled by a dedicated AUX4 circuit). A bucket diverter valve kit (AUX3) is also available to operate a clam shell bucket attachment. Other options include LED lights and an easy to install beacon. For safer transport, four additional tie down points have been added on the upper structure. As before, the new R-Series excavators offer the easy access that Bobcat is famous for, for regular maintenance and servicing. Exterior covers have been designed to be easy to open and close.